Kokoshnik is a traditional Russian head-dress worn by women and girls. It is tied at the back of the head with long thick ribbons in a large bow. During the revival of Russian national culture in the late 19th century, these diadem-shaped tiaras became part of the official court dress for royalty and ladies-in-waiting. A woman head wearing the Kokoshnik inside contours of various shapes was used from 1899 to mark Russian silver. These marks are commonly known as "Kokoshnik". 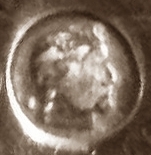 In 1896 was introduced a mark with a female head silhouette facing left and silvers fineness expressed in zolotnicki inside an oval oblong or a circular cartouche. On the right side were inscribed the assayer's initials in Cyrillic characters. 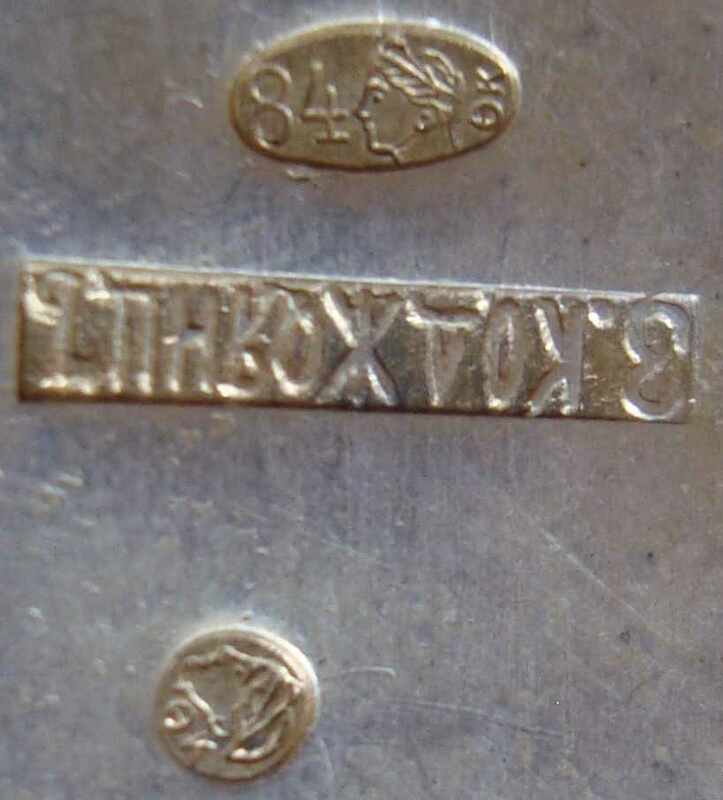 In 1908 was introduced a new mark with a more detailed female head facing right and silver fineness expressed in zolotnicki inside an oval oblong cartouche. 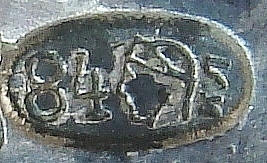 The left side was inscribed with the town/region symbol. 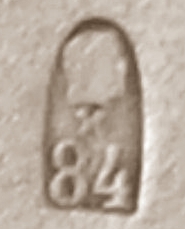 Besides the oval mark, was available also a circular kokoshnik mark struck as a garniture mark on small items or on auxiliary parts of an ensemble en suite. Here the assay office was indicated by a Morse-code like series of dots and dashes around the perimeter of the mark. Russian silver is highly appreciated by collectors and antiques' market is invaded by a wide production of modern forgeries made in Poland, Ukraine, Romany, Hungary and other East European countries. They bear counterfeit Imperial Russia marks. These are examples of fake Kokoshnik 1908-1926 marks. 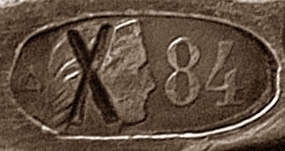 The Kokoshnik mark (1908-1926 version) was reinstated in 1985 creating some confusion in the dating of Russian silver and opening the way to the possibility of deliberate falsification. More recently the kokoshnik mark was slightly modified assuming a rounder contour than the pre-Revolutionary form.